Perhaps the best part of this trip, and the real destination, was Landmannalaugar. 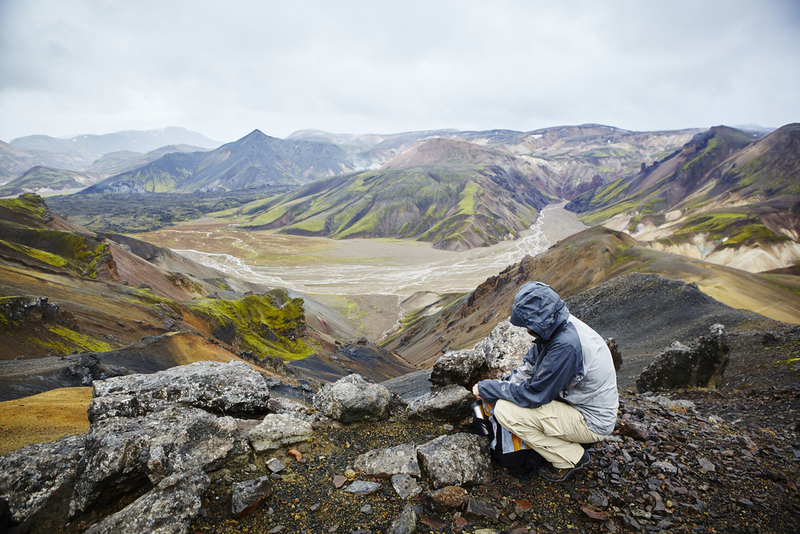 Accessible only by 4x4 - or the giant tour busses that take people out there in droves - Landmannalaugar is riddled with hiking trails that sprout out from a camp site, caretakers cabin, and amazing hot springs. Luckily there were no tour busses when we were there and the area was fairly deserted except for the occasional french adventurer. We would hike all day through the country on the quite well (for the most part) marked, color coded, trails that weaved up and over the mountains and along beautiful ridges that surrounded the valley. For the most part, it was just us and the sheep. Every evening we would come back, soak for a while in the hot springs, cook some noodles, drink some whiskey and tea, and go plop ourselves down in the tent for the evening... occasionally waking to incredible wind or torrential downpour. As morning came, we would make coffee and breakfast and head out again on another trail. Iceland was desolate, barren, green and incredibly beautiful in a very stark kind of way. It took a while to get used to the fact that there were hardly any trees. Roads that would stretch on forever (watch out for those speed traps) and a different glacial view around every bend. There were surprisingly few people outside of Reykjavík. Iceland, with a total population of 325,671 and over 200,000 living in the Reykjavík region, left a lot country to be filled. It seemed like every car we passed was another set of tourists - locals were scare out in the country. Despite the dumping of rain, howling winds, cloudy days, and sometimes very cold nights, Iceland was a beautiful place. 10 days is hardly enough. Don't bother with the blue lagoon... When we went, it was howling with wind, raining and freezing cold. We ran to the dingy blue water expecting some sort of relief from the cold only to plunge into lukewarm waters. A huge letdown for the insanely overpriced experience that it was. If you do go, pull up a handful of the filth that is the bottom of the lagoon for a scary surprise. There are many hot springs in Iceland that don't cost €35 (and up to €165) - go find one of them.